Encouraging People to Proceed in the path of Allah SWT and Seeing them Off. Rasulullah SAW walks with the Mujaahideen and advises them. 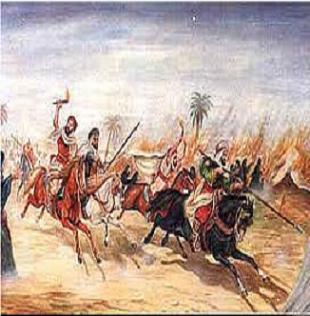 Abdullaah bin Abbas reports that Rasulullah walked with them up to Baqi Gharqad when he sent them off on an expedition. He then said to them, "Proceed in the name of Allah. 0 Allah! Assist them." ('I When Abdullaah bin Yazeed RA was once invited for a meal, he mentioned to the people that whenever Rasulullaah SAW bade farewell to an army, he prayed, "In Allah's care do I hand over your Deen, your trusts and the results of your deeds." Saidina Abu Bakr RA sees the Army of Usama RA. In a narration discussing the dispatching of Usama's army, Hasan RA,-narrates that Saidina Abu Bakr RA left his home to meet the army. As he saw them off, Saidina Abu Bakr RA walking while Usama RA rode his animal. In the meanwhile, Abdur Rahmaan bin Auf RA was leading Saidina Abu Bakr RA with animal along. Usama RA said, "0 Khalifah of Rasulullaah! Either you ride or I shall dismount." Saidina Abu Bakr RA instructed, "By Allah! Neither should you dismount nor shall I ride! What harm can there be if my feet get dusty for a while in the path of Allah? A person proceeding in the path of Allah SWT receives the reward of seven hundred good deeds for every step he takes. In addition to this, his status is elevated by seven hundred degrees and seven hundred of his sins are forgiven." Ghazwa of Badr - 313 Mujahidin vs 1000 Musyrikin. 4.Maalik and Bayhaqi, a s quoted in Kanzul Ummaal(Vol.2 Pg.295).